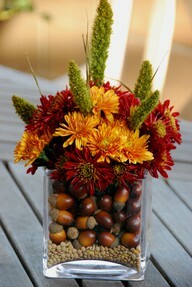 We wanted to share some creative, fun yet easy ideas to create a beautiful tablescape for your Thanksgiving table. There are many things around your house and backyard that you can use to decorate your Thanksgiving table! Find some leaves that have fallen off the trees that still have a pretty red or orange color to them and maybe some pine cones, acorns, berries and even some nice looking branches. 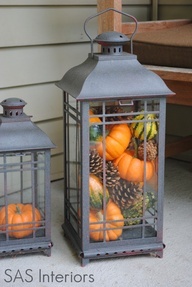 Once you have collected a little pile, put them into a vase or lantern of your choice and that will create a beautiful centerpiece that your family will be sure to love! 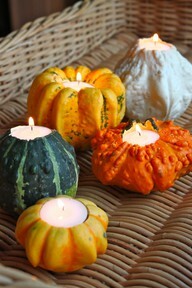 You can also go and buy some gourds or small pumpkins to decorate your table with! If you are feeling really creative you can cut a hole in the gourd or pumpkin and create a perfect place for a votive candle! 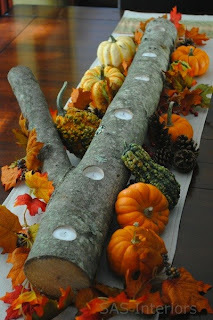 Whatever you decide to create for you Thanksgiving table be sure to be creative and have fun with it! There are so many things you can do that are simple and fun for the whole family to join in. New Tablescapes at the Studio!